Although it’s officially fall, and sometimes we tend towards the more robust wines I say, “Go for the Riesling!”. I was making scallops with bacon in a reduced cream sauce. Think leeks and lemon zest for brightness…and I knew we needed a white. But not a Chardonnay, although the Joyce “Stele” would have worked. So I went with the Riesling and it was a huge hit. 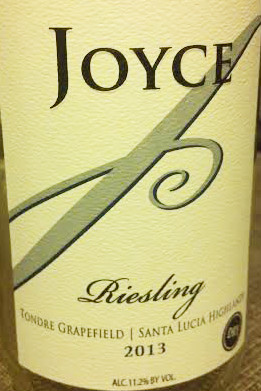 The Joyce 2013 Riesling, first of all has a fantastic nose. It is just oozing that meadow and mineral palate that marks a well done Riesling. But it’s not cloying at all, it is just dry enough, really well balanced and a delicious drinking wine.